They're sort of doomed to receive TV on the Radio comparisons because of the way their fused sound makes them palatable to the indie crowd, not that this would be an insult in the least. 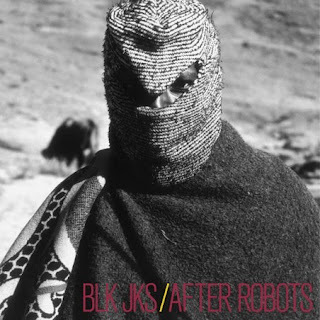 And where the comparison is fairly drawn between TVotR and Johannesburg-based Blk Jks, whose Mystery EP gave a small taste earlier this year, is in their shared ability to shuffle between the peaceful and the frantic, blending at once elements of retro African percussion and brass with buzzing guitars. Well, that and the harmonies that fall gracefully into falsetto and call to mind the trade-offs between Tunde Adebimpe and Kyp Malone. But Blk Jks carry a heavier prog factor, led unapologetically by guitarist Lindani Buthelezi, and have no trouble transitioning from dub-style guitar to that occasionally drawn-out progressive riff (as with “Skeleton”), all the while holding their own over prominent feature from the Hypnotic Brass Ensemble, which takes over a great deal of rhythm on album opener “Molalatadi” prior to breaking into a duel with Buthelezi's guitar. After Robots is pure art, beautifully done all the way through, heavily influenced but undoubtedly fit for the future. Download a whole mess of live tracks at Daytrotter! See Blk Jks on tour!